For other uses, see Kara Hisar. Afyonkarahisar (Turkish pronunciation: [afjonkaɾahiˈsaɾ], Turkish: afyon "poppy, opium", kara "black", hisar "fortress") is a city in western Turkey, the capital of Afyon Province. Afyon is in mountainous countryside inland from the Aegean coast, 250 km (155 mi) south-west of Ankara along the Akarçay River. Elevation 1,021 m (3,350 ft). Population (2010 census) 173,100  In Turkey, Afyonkarahisar stands out as a capital city of thermal and spa, an important junction of railway, highway and air traffic in West-Turkey, and the grounds where independence had been won. In addition, Afyonkarahisar is one of the top leading provinces in agriculture, globally renowned for its marble and globally largest producer of pharmaceutical opium. 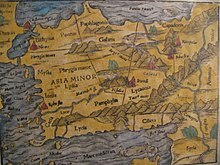 Photo of a 15th-century map showing region containing Nicopolis. The area thrived during the Ottoman Empire, as the centre of opium production and Afyon became a wealthy city. In 1902, a fire burning for 32 hours destroyed parts of the city. During the 1st World War British prisoners of war who had been captured at Gallipoli were housed here in an empty Armenian church at the foot of the rock. During the Greco-Turkish War (1919-1922) campaign (part of the Turkish War of Independence) Afyon and the surrounding hills were occupied by Greek forces. However, it was recovered on 27 August 1922, a key moment in the Turkish counter-attack in the Aegean region. After 1923 Afyon became a part of the Republic of Turkey. The region was a major producer of raw opium (hence the name Afyon) until the late 1960s when under international pressure, from the US in particular, the fields were burnt and production ceased. Now poppies are grown under a strict licensing regime. They do not produce raw opium any more but derive Morphine and other opiates using the poppy straw method of extraction. Afyon is the centre of an agricultural area and the city has a country town feel to it. There is little in the way of bars, cafes, live music or other cultural amenities, and the standards of education are low for a city in the west of Turkey. Afyon Kocatepe University. Afyon is known for its marble (in 2005 there were 355 marble quarries in the province of Afyon producing high quality white stone), its sucuk (spiced sausages), its kaymak (meaning either cream or a white Turkish Delight) and various handmade weavings. There is also a large cement factory. Kaymak lokum, Turkish delight of cream, a speciality of Afyonkarahisar. ^ Lewis Thomas (Apr 1, 1986). Elementary Turkish. Courier Dover Publications. p. 12. ISBN 978-0486250649. ^ a b Evren Ekiz (2016). termal turizmde farkli bir destinasyon: jeoturizm (afyonkarahisar örnegi) (PDF). p. 70. ^ "Afyonkarahisar - Turkey". britannica.com. Retrieved 8 April 2018. ^ Rosie Ayliffe (2003). TURKEY. p. 606. ^ "The project created in Afyon, thermal greenhouse out of 660 thousand square meters". www.habermonitor.com. Retrieved 8 April 2018. ^ Erica Highes (2013). Meaning and λόγος: Proceedings from the Early Professional Interdisciplinary. University of Liverpool. p. 29. ^ a b US Department for State Bureau. International Narcotics Control Strategy Report. p. 388. ^ "Latest intelligence - Turkish town burnt". The Times (36861). London. 1 September 1902. p. 4. ^ Central Bank of the Republic of Turkey Archived 2009-06-03 at WebCite. Banknote Museum: 1. Emission Group - Fifty Turkish Lira - I. Series Archived March 5, 2009, at the Wayback Machine. – Retrieved on 20 April 2009. ^ Belkıs ÖZKAR. mermer sektöründe katma degerin ve ihracatin artirilmasi (PDF). p. 29. Archived from the original (PDF) on 2016-08-10. Retrieved 2016-06-22. ^ Dilsad Erkek. Mermer ve Traverten Sektörüne Küresel ve Bölgesel Yaklaşım (PDF). p. 25. ^ Sevgi Gürcan. Türkiye ve Afyon'da mermer sektörünün gelisim trendi, Kocatepe University (PDF). p. 389. ^ Nuran Tasligil. Die Analyse der als Baumaterial genutzten, Marmara University. p. 619. ^ Barbara E. Borg (2015). A Companion to Roman Art. p. 157. ^ Strabo. Geography. "Book 9, chapter 5, section 16"
^ Donato Attanasio (2003). Ancient White Marbles. p. 154. ^ Donato Attanasio (2003). Ancient White Marbles. p. 157. ^ Anthony Grafton (2010). Classical Tradition, Harvard University. p. 842. ^ William Lloyd Macdonald (2002). The Pantheon, Harvard University. p. 86. ^ J. Clayton Fant (1989). Cavum Antrum Phrygia. p. 8. ^ Kathleen S.Lamp (2013). A City of Marble, University of South Carolina. ^ James E. Packer (2001). The Forum of Trajan in Rome. p. 120. ^ Ben Russell (2013). The Economics of Roman Stone Trade, Oxford University. p. 229. ^ John W. Stamper (2005). The Architecture of Roman Temples, Cambridge University. p. 137. ^ John W. Stamper (2005). The Architecture of Roman Temples, Cambridge University. p. 136. ^ Max Schvoerer (1999). ASMOSIA 4, University of Bordeaux. p. 278. ^ Gilbert J. Gorski (2015). The Roman Forum, Cambridge University. p. 19. ^ Gregor Kalas (2015). Restoration of The Roman Forum in Late Antiquity, University of Texas. p. 43. ^ L. Richardson (1992). A New Topographical Dictionnary of Ancient Rome, The Johns Hopkins University. p. 176. ^ Lawrence Nees (2015). Perspective on Early Islamic Art in Jerusalem. p. 107. ^ The Economics of the Roman Stone Trade, Oxford University. 2014. p. 324. ^ Janet DeLaine (1997). The Baths of Caracalla. p. 32,70. ^ Dante Giuliano Bartoli (2008). Marble Transport in the Time of the Severans, Texas University (PDF). p. 154. ^ Nadine Schibille (2014). Hagia Sophia and the Byzantine Aesthetic Experience, University of Sussex. pp. 241–242. ^ Keith Miller (2011). St. Peter's, Harvard University. p. 110. ^ Ben Russell (2014). The Economic of the Roman Stone Trade, Oxford University. p. 28. ^ Barbara E. Borg (2015). A Companion to Roman Art. p. 124. ^ Abu Jaber; N. Bloxam. QuarryScapes, Geological Survey of Norway (PDF). p. 102. ^ Marc Waelkens (2000). Sagalassos Five, Leuven University. p. 339. ^ Donato Attanasio; Mauro Brilli (2006). The Isotopic Signature of Classical Marbles. p. 151. ^ Kurtulus Karamustafa; ömer Sanlioglu; Kenan Gülle (2013). Ulusal Turizm Kongresi, Erciyes University. pp. 245–246. ^ Prof.Ergün Türker; Ahmet Yildiz (2008). Termal ve Maden Sulari Konferansi, Afyon University (PDF). p. iX. ^ Şafak, Yeni (17 August 2015). "Kızılay maden suyu 17 ülkeye satılıyor". Yeni Şafak. Retrieved 8 April 2018. ^ Zohara Yaniv; Nativ Dudai (2014). Medical and Aromatic Plants of the Middle-East. Institute of Plant Sciences. p. 328. ^ (TÜİK), Türkiye İstatistik Kurumu. "Türkiye İstatistik Kurumu, Hayvansal Üretim İstatistikleri, Haziran 2015". www.tuik.gov.tr. Retrieved 8 April 2018. ^ "Et fiyatları artık Afyon'da belirlenecek - Son Dakika Ekonomi Haberleri - STAR". star.com.tr. Retrieved 8 April 2018. ^ YABANTV. "Tarımda Afyon Modeli!". yabantv.com. Retrieved 8 April 2018. ^ "'Fiyat istikrarı için et sınıflandırılmalı' - Memurlar.Net". www.memurlar.net. Retrieved 8 April 2018. ^ "Afyonkarahisar Where the old world meets the new". dailysabah.com. Retrieved 8 April 2018. ^ foundation of egg producers (2015). Yumurta Tavukculugu verileri (PDF). p. 4. ^ "Company Profile". www.afyonyumurta.com.tr. Archived from the original on 2018-04-09. Retrieved 8 April 2018. ^ "Meteoroloji" (in Turkish). Retrieved 8 January 2016. ^ "Müzeler-Zafer Müzesi (Başkomutan Tarihi Milli Park Müdürlüğü)" (in Turkish). Ayfonkarahisar İl Kültür ve Turizm Müdürlüğü. Retrieved 2015-08-10. ^ Stanford, Jay Shaw (1976). History of the Ottoman Empire and Modern Turkey. Cambridge University. pp. 239–241. ISBN 9780521291668. Wikivoyage has a travel guide for Afyonkarahisar. Wikimedia Commons has media related to Afyonkarahisar. Wikisource has the text of the 1905 New International Encyclopedia article Afiun-Kara-Hissar.